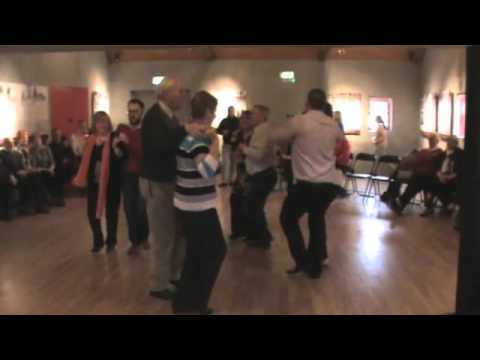 The Moate Set was established in the 1940’s and danced locally at house dances. The Set was revived in the 1980’s by Frank Bracken and danced locally in Dun Na Sí CCE Cultural Centre used by the local set dancers. In 1992 Joe and Siobhán O Donovan did a workshop in Dun Na Sí to keep the set alive. In 2014 Bridie Hamm, Tom Shine, Nicky Finn and Sharleen McCaffrey got together to bring the set into the next generation. 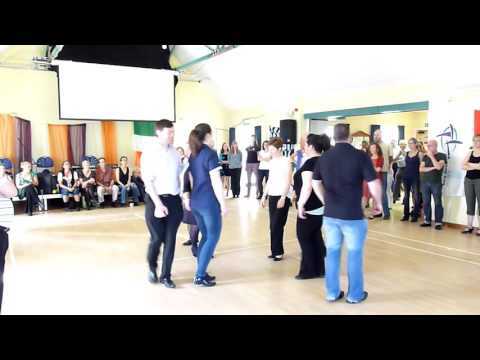 3 Lead around to the right and dance in place With gents holding ladies' right hand in right on ladies' shoulder and left hand in left in front, lead around one position to right (2b) and dance on the spot (2b). Without releasing hands, ladies dance sideways left, in front of partner, as gents dance to the right, bringing left hands onto ladies’ left shoulder and holding right hands in front (2b). All dance on the spot (2b), ladies and gents having swapped places. All couples dance on to next position and dance on the spot (4b), then swap places again and dance on the spot (4b). Repeat until home, but instead of swapping places the final time, move into the back to back formation. 3 St. Brigid's Cross Everyone moves at the same time, ladies dancing one pattern while the gents dance another. All ladies dance to the centre of set (2b); turn 90° left / anticlockwise on the spot (2b). Ladies dance out to position on left of original position (2b) and turn 180° clockwise into place (2b). Repeat these 8 bars three times until home, turning to face their partner at the end. All gents dance on one position to the right on the outside (2b) and turn 90° left / anticlockwise into the set (2b). Gents dance to centre of the set (2b) and turn 90° clockwise on spot (2b). Gents dance out to next position (2b); turn 180° left / anticlockwise on the spot (2b); dance back to the center (2b); and turn 90° right / clockwise (2b). Repeat these 8 bars once. Gents dance out to their home position (2b); turn 90° left (2b); and dance on the spot (4b).